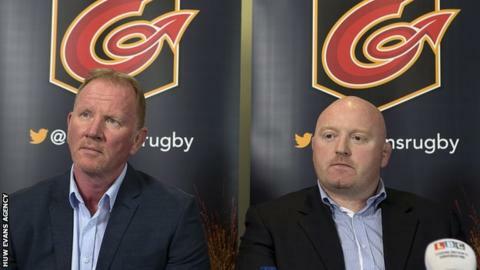 Bernard Jackman took over as Dragons coach in June 2017 when Stuart Davies (l) was chief executive. Dragons coach Bernard Jackman says changes in the region's management will not affect his role in rebuilding the playing squad. Stuart Davies stepped down as chief executive on Friday after nearly three years, with businessman David Buttress appointed executive chairman. Dragons is expected to restructure the business in 2018, but Jackman says the team is his only concern. "My job is rugby so it won't have any effect on me," said the Irishman. "I have faith in the board who are reorganising our structure and my job is to try and build a team - so that's got nothing to do with me really. "We've got our budgets and our plans so I just crack on." Speaking after Dragons' 25-27 home defeat by Newcastle Falcons in the European Challenge Cup, Jackman said the region planned to continue aggressive player recruitment. Buttress was behind the signing of Wales and British and Irish Lions back-rower Ross Moriarty. They have also been linked with Wales and Lions wing George North and Australian back Quade Cooper. "We've never hidden away from the fact we need to rebuild the squad," added Jackman. "We want to be ambitious and competitive so recruitment is part of that. "Whether you are going well or if you're struggling you're always going to have to improve the depth of your squad and we're certainly doing it."